Carp spawn requires natural feed immediately after stocking and hence it is essential to have a minimum plankton value of 30–40 ml/m3 in case of stocking at a moderate rate (1.5–2.5 million/ha). Combined rearing of two or more species of spawn should not be done in nursery ponds. The pond should be stocked after three days of hatching when their sizes range from 0.60–0.75 cm and counts on an average about 500 nos./ml. 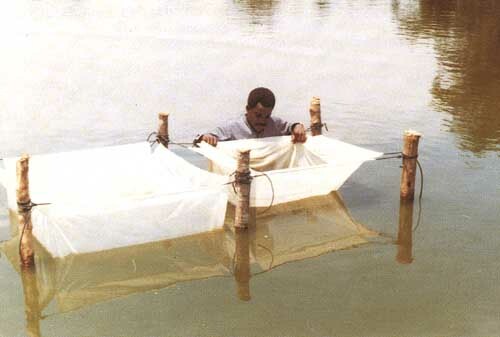 Rearing of fry to fingerling stage is done in rearing ponds where fry are stocked at the rate of 0.25–0.30 million/ha with a survival level of 60–80% under proper pond conditions. Either monoculture or polyculture methods can be adopted for this rearing. Prior to stocking the rearing ponds the pond waters must have a plankton level of about 30–50 ml/m3. After proper preparation, the pond should be stocked with 100–150 mm long fingerlings of desired carp species. In case the fingerlings are not available, the pond can also be stocked with advanced fry or early fingerlings in absolutely predator-free ponds. The stocking rate depends primarily upon the volume of water and on the oxygen balance of the pond. Depending on availability of seed and market condition, stocking can be of 3, 4 or 6 species combination in the following ratios. Stocking of spawn, fry and fingerlings should be done very carefully to avoid any post-stocking mortality due to shock or infections. To minimize post-stocking mortality the fry/fingerlings should be slowly and gradually acclimatized to the temperature and quality of the water in the stocking pond. To do so, open the mouth of the seed transport bag/container and gradually add the pond water in phases and after 15–20 minutes slowly dip and tilt the bag/container in the pond so that the spawn/fry/fingerlings are free to swim out. Stocking should preferably be done in the cool evening hours. Post-stocking management involves harnessing the pond productivity in the form of natural fish food, maintenance of pond environment congenial to the cultivated fish and fish husbandry, mainly feeding and health care.